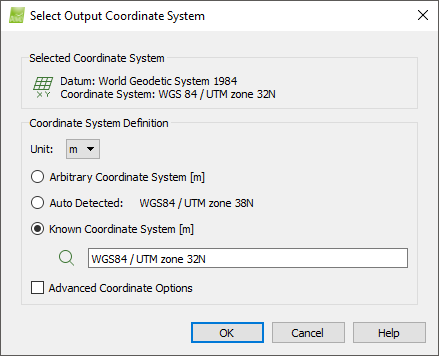 Important: The output coordinate system does not need to be the same as the images' coordinate system or as the GCPs' coordinate system. It is recommended, though, that the output coordinate system is the same as the GCPs' coordinate system. Selected Coordinate System: Section that displays the currently selected coordinate system. Coordinate System Definition: Section that allows to select the coordinate system. OK: Confirms and applies the changes. Cancel: Does not save the changes and exits the pop-up. Datum: Represents the selected datum. Coordinate System: Represents the selected 2D coordinate system. When the selected coordinate system is WGS 84. When the selected coordinate system is any Coordinate System other than WGS 84. For the images: WGS84 (egm96). If the images are captured with a senseFly drone, the default Selected Coordinate System is WGS 84 (Geoid HeightAbove WGS 84 Ellipsoid=0). Unit: It is used to set the unit of the coordinate system. The unit can be meter (m) or international foot (ft). Arbitrary Coordinate System [unit]: It is used for coordinate systems that the origin, the scale and the orientation are defined by the user. Auto detected (only for the Output Coordinate System): Based on the coordinates of the images and the selected unit, Pix4Dmapper auto detects a coordinate system. If the project does not have image geolocation, this option is not available. Known Coordinate System [unit]: It is used to select a known coordinate system. The search text box allows to find the coordinate system in auto-complete mode from Pix4Dmapper's database. 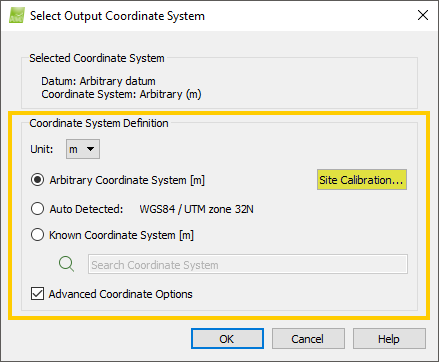 Access: This button is displayed only for Arbitrary Coordinate System set as Output Coordinate System when the Advanced coordinate Options box is selected. It is useful to define the transformation between a known coordinate system (the one of the images or an user defined system) and an arbitrary coordinate system. Example: When this transformation is known, it can be used to define an arbitrary output coordinate system, without needing GCPs. It is useful for RTK GPS projects without GCPs. Projection: Defines the known coordinate system involved in the transformation. Translation X [unit]: Translation along the X axis. Translation Y [unit]: Translation along the Y axis. Translation Z [unit]: Translation along the Z axis. Rotation X [degree]: Rotation around the X axis. Rotation Y [degree]: Rotation around the Y axis. Rotation Z [degree]: Rotation around the Z axis. Scale: Scaling between the two systems. Clear: Clears the transformation parameters. Load Optimized: Loads the optimized transformation parameters that are displayed in the Quality Report. This option is available only if the project has GCPs. Export...: Exports the transformation parameters to file. Access: This section is displayed for Auto detected and Known Coordinate System when the Advanced Options are enabled. It defines the vertical coordinate system. egm84: When the altitudes are based on the EGM84 geoid. The approximate EGM84 geoid height above WGS84 is displayed. egm96: When the altitudes are based on the EGM96 geoid. The approximate EGM96 geoid height above WGS84 is displayed. egm2008: When the altitudes are based on the EGM08 geoid. The approximate EGM08 geoid height above WGS84 is displayed. Geoid Height Above WGS84 Ellipsoid [unit]: When the altitudes are based on a geoid other than EGM84, EGM96, EGM08. The user can set the difference between the geoid and the WGS84 ellipsoid. If the altitudes are based on the WGS84 ellipsoid, then the Geoid Height Above WGS84 Ellipsoid is 0.000 (zero). Arbitrary: When the reference of the altitudes is unknown, user defined or the ground (Above Ground Level altitudes). When this option is selected, no altitude conversion is performed. Access: This button is displayed for Known Coordinate System when the Advanced Options are enabled. It is used to define the coordinate system. The .prj file contains information that defines the coordinate system. For more information about the Coordinate system file: Input files. Select this option to import an existing .prj file. For more information about how to obtain or create a .prj coordinate system file: How to obtain or create a .prj coordinate system syntax file. On File name it is displayed the selected .prj file. Open: Opens the selected folder. It is used to select a known coordinate system from Pix4Dmapper's database. On Datum, by clicking on the arrow, a drop-down list appears that allows to select among different datum. On Coordinate System, by clicking on the arrow, a drop-down list appears that allows to select among different coordinate systems. 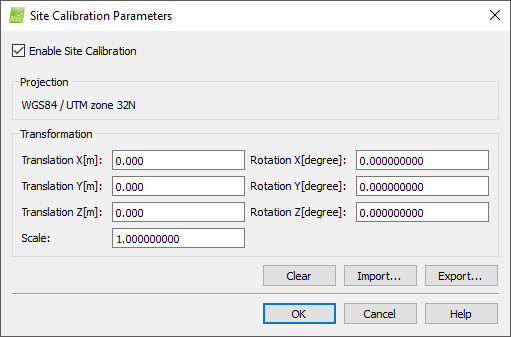 The EPSG Geodetic Parameter Dataset is a widely used database of Earth Ellipsoids, geodetic datums, geographic and projected coordinate systems, units of measurements, etc. It is used to select a known coordinate system from an EPSG code. On the Choose EPSG Number section, by clicking on the arrow, a drop-down list appears that allows to select among different EPSG codes. When I import my Images from my DJI drone I usually choose WGS84 coordinate system and Output Coord. System CH1903+/LV95. But my Images are always around 1km south on the map. Which Image Coord. System do I have to choose? Can I delete unused images in the project or only deactivade it? Can you tell me what drone configuration do you have (drone + camera + mobile device)? As for now, you can only disable the unnecessary images. If you deactivated the images after you processed step 1, please remember to Reoptimize your project. Read more Difference between "Reoptimize" and "Rematch and Optimize". I am using right now a DJI Mavic Air with a Galaxy Note 8. The DJI Mavic Air writes only approximate coordinates for image geolocation and we recommend using Pix4Dcapture and synchronize images with the mobile device in order to get more precise coordinates. In Pix4Dcapture, we incorporated precise image geolocation in the p4d file generated when downloading the images to the device. If you process your images with the .p4d file, they will have the right geolocation. More info about .p4d file generation here and how to transfer and process images after a mission here. If you do not use Pix4Dcapture, going through the workaround 2 of the official comment of our technical support on our community should also solve this geolocation issue. Many times I don't get a such a file. It doesn't even show me the caputred picutres in the App. Sometimes it works and it starts synchronizing after the mission, then I get this file. Is there any possibility to set some markers and lines in the Desktop software , same like in the cloud? Another thing I would like to do is to stitch some picutres togheter, for example to make one high resolution picture of one side of a building. It should have the same quality like the captured pictures. Would that be possible? As a reminder, this space is dedicated to give feedback about the articles themselves. For example, we will be glad to get your feedback if, from your perspective, you are noticing wrong, missing, outdated or unclear information. Your questions are not really related to the above article and then I would suggest you write on our community or to contact us via our support website. 1) About the possibility to measure distances, area or volume with Pix4Dmapper, I would suggest you have a look at this article. 2) I am not really clear with your project here. If my understanding is correct you would like to do two separate acquisitions and then merge them into one single project. If so I would suggest you read this article. Although we recommend merging separate projects, you can also process one single project even if two cameras were used, it will be recognized from the EXIF files.